PHUKET: The 19th Laguna Phuket Triathlon (LPT) takes place this Sunday at 6:30am. The event has attracted a world class international field to Asia’s premier destination triathlon. The LPT consists of a 1.8 kilometer swim, 55km bike ride and 12km run through the tropical scenery of Laguna. Australian Chris “Macca” McCormack, the two-time Ironman World Champion and one of the most successful athletes in triathlon history, has signed up to compete in the Laguna Phuket Triathlon (LPT) and Ironman 70.3 Laguna on December 2. Macca has won 200 races around the world since 1993 including 12 Ironman victories, more than any other male competitor. He is also the only triathlete ever to be Olympic Course and Ironman World Champion. Both LPT and Ironman 70.3 Laguna Phuket will attract a field of about one thousand athletes from around the world, and are linked by a ‘tri-fest’ of training and social activities at Laguna Phuket during the week between the two Sunday races. With some athletes opting to take on the challenge of competing in both events, there are a number of intriguing duels in store. One of the most prominent will be between Laguna veteran Belinda Granger of Australia and Czech Olympian Radka Vodickova, who are both vying to become LPT’s first-ever women’s triple champion. Italian Massimo Cigana, LPT’s first-ever triple champion in the men’s field, returns to defend his title in a bid to be a four-time champion. He will face stiff opposition from elite pros such as American Chris Lieto – an Ironman champion renowned as the ‘fastest cyclist in triathlon racing’. The reputed fastest cyclist in triathlon, Chris Lieto, is heading back to Phuket to compete in the Laguna Phuket Triathlon (LPT) and Ironman 70.3 for his second year. Lieto says he is keen to make up for his Phuket debut last year, when he was forced to retire from the 70.3 after crashing on the bike course. Renowned as the fastest American Ironman and one of the top professional triathletes in the world, Lieto has recorded 15 major victories, including three Ironman wins, a U.S. Ironman Championship and three Top 10 finishes at the Ironman World Championship in Kona, Hawaii, highlighted by a second-place finish in 2009. The recently-crowned 2012 Ironman 70.3 World Champion, Leanda Cave, signed up for the Laguna Phuket event less than 24 hours after completing her epic World Championship victory in Las Vegas on September 9, and before resuming training for her next title bid at the Ironman World Championship in Kona, Hawaii on October 13. Laguna’s confirmation of Cave’s participation has set the stage for a thrilling duel with 2011 Ironman 70.3 World Champion and defending Laguna Phuket 70.3 Champion Melissa Hauschildt of Australia who was beaten into fourth place on September 9 by Cave, more than seven minutes behind Cave’s winning time of 4:28:05. 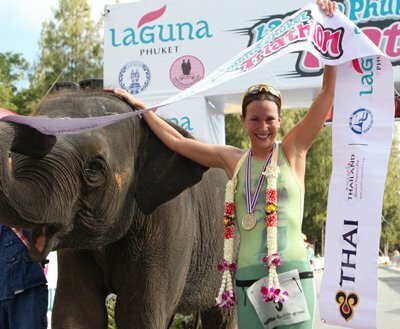 At Laguna Phuket, Hauschildt will be aiming to hold off the challenges of Cave, Rodickova, Granger and a field of other top pros to hold on to her 2011 title, which she won with a course record of 4:17:01. Two intrepid endurance reality TV stars are also making Ironman 70.3 Laguna Phuket the final leg of a global adventure challenge that will be seen by millions of viewers across North America and elsewhere around the world. Laguna Phuket Triathlon is on Sunday November 25 and the Ironman 70.3 is December 2. A number of events will be held in the week between the triathlons to keep those in attendance busy. The Laguna Phuket Triathlon is proudly sponsored by the Phuket Gazette, PGTV and the nationally televised ‘Phuket Today’ show on UBC/True Visions, (channnel 99). ‘Phuket Today’, co-produced by PGTV and MCOT World, will be providing coverage of this event. The half-hour show runs six times a week, starting every Sunday at 7:10pm.